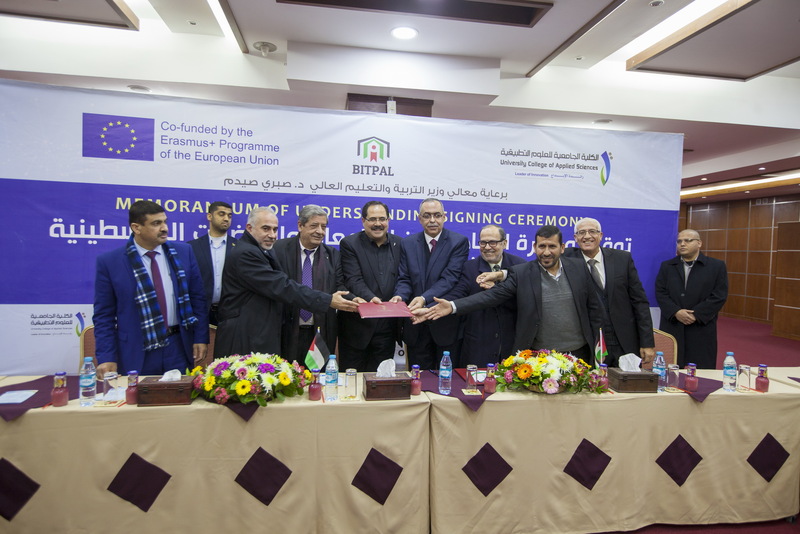 Under the patronage of His Excellency the Minister of Education and Higher Education Dr. Sabri Saidam, the BITPAL project signed the memorandum of understanding between Palestinian partner universities and Palestinian Incubators in Gaza. HE Dr. Saidam expressed his appreciation to all efforts to improve the ICT education sector. Prof. Rifat Rustom the UCAS president welcomed all partners’ presidents, PITA regional manager and BITPAL team and thanked the European commission that supported this project and the National Office for the Erasmus Program in Palestine, he added that this project is one of the most important projects coordinated by UCAS which support the curricula development and the technological progress in Palestine. Dr. Ahmed Abdalaal the project coordinator talked about BITPAL and its role in developing IT curricula. He said that this work was the result of the joint work between the universities and the incubators and this joint work has led to the opining of the first Entrepreneurship and Freelancing course which will teach the students how does a good idea become a viable business, and what is entrepreneurship and freelancing. He added this course will mix between the lectures style with case study and action-based activities like assignments and one-to-one mentorship and coaching. Dr. Abdalaal also confirmed that the European Commission and the ERASMUS+ European programme support these projects in Palestine.